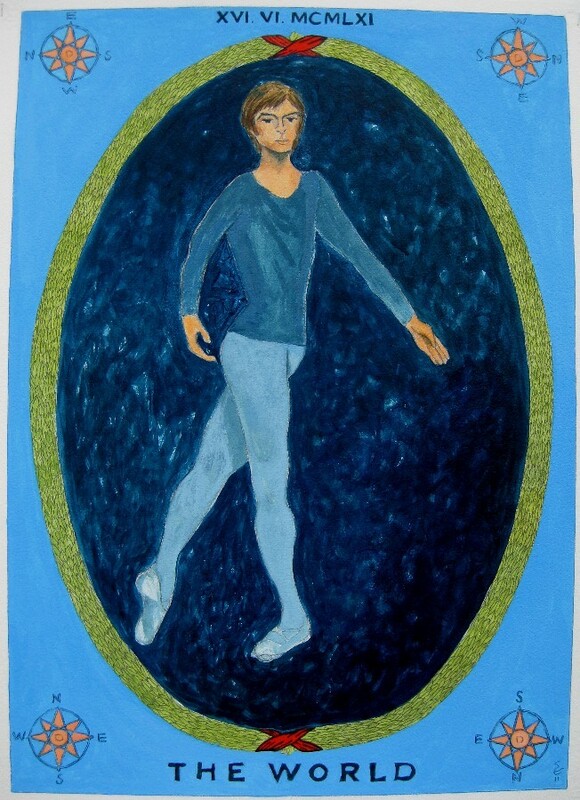 Rudolf Nureyev, 16 June 1961, Mixed Media, 30" x 22"
Fifty years ago today, on June 16th, 1961, at Le Bourget Airport, Paris, France, Rudolf Nureyev did not board the plane waiting to take The Kirov Ballet to London. Neither did he board the plane sent to take him back to Moscow. He declared himself 'Dancer' and from then on, his true country would be 'Dance'. I have been working on a series of paintings called 'Nureyev's World'. I realized that I wanted to do a painting to mark this anniversary. This moment has so often been referred to as 'Nureyev's Leap to Freedom'. I wasn't interested in that image as a theme. Whatever actually happened during those moments when Nureyev was seeking asylum in Paris, the thought that came to my mind, over and over, was all about 'Fate'. No matter how you see your life, no matter how you see what your future may hold, or how you plan for it - fate steps in. And in a heartbeat, your life is changed forever. Once that became the theme for me, I couldn't get the idea of an image adapted from a Tarot card out of my head. I thought of three cards that might have worked, but really there was only one choice. Nureyev's moment of fate was a completion and a new beginning. He would now start building his World, his way. * Nureyev's quote is taken from the film 'Nureyev', produced and directed by Patricia Foy (c) 1991 by Antelope Films Limited/Orfeo Films Limited, RM Associates. The DVD titled 'Nureyev' is now distributed by EMI classics (c) 2008. The image I used for the starting point of my painting is 'XXI - The World' Tarot card as represented by the Universal Waite deck of Tarot cards. What a lovely painting Sharon and I really enjoyed your post along with it. Awww Julie, Thank you! And you know I wouldn't think that's nutty at all...but stop with the Tower card already! I've seen your World view. It is very good. Much better card for you! No, I haven't seen 'Emma' yet - and I've wanted to. Next rainy day - I'll watch for the globe. Hope you're feeling much better now and that your weekend is wonderful. Amy, Thank you. With the on-going Blogger issues I've really missed you. Hope your weekend is warm and wonderful. Interesting post about Nureyev--different kind of guy! I have to say I'm more drawn to your more graphic pieces. 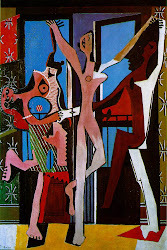 This seems very delicate compared to your other paintings that project strong images. Maybe its just me. Emma is a wonderful movie too btw. Something good for a rainy day. Sharon,what a lovely painting and a story behind it! I do believe in Fate, but I also believe that one has to make these "6 steps". Hello Elena,(& Russ). Thank you! And I do agree with you. Fate does it's thing, but it is how you meet it, that ultimately determines your future. Hi Stepahnie! Thank you for sharing your point of view. I do understand what you are saying. And STEPHANIE - sorry about the typo! I shouldn't be typing. I've had way too much coffee. The painting looks great, thanks for sharing. Hello Toyin, Welcome! and thank you for your comment. I'm happy that you like the painting - my pleasure! Hi Julie, Hope you're finally feeling better?!? I loved that post and thought your name for the Blue Lady was very clever. Also, the fact that you could actually get her to smile! Hope it works.